President Donald Trump officially recognized Jerusalem as the capital of Israel on Wednesday, calling it an "overdue step" for peace efforts between the Jewish state and the Palestinians. "It is time to officially recognize Jerusalem as the capital of Israel," Trump said in remarks at the White House. "While previous presidents have made this a major campaign promise, they failed to deliver. Today, I am delivering." Palestinian Authority President Mahmoud Abbas has said such a move threatens the peace process, and other Middle Eastern leaders have warned the move could inflame tensions in the region. Trump said he had judged this course of action to be in the best interest of the U.S. and the peace process. "This is nothing, more or less, than a recognition of reality," Trump said. Trump also announced that he is directing the State Department to make preparations to move the U.S. embassy in Israel from Tel Aviv to Jerusalem. The Jerusalem Embassy Act, which the U.S. Congress passed by wide margins in 1995, calls for the U.S. to recognize Jerusalem as Israel's capital and move the embassy there. But the measure includes a provision that allows the president to issue a waiver to delay the embassy move six months at a time, if the president determines it is in the U.S. national security interest. Every president since then has consistently used the waiver authority to hold off moving the embassy. Trump, who signed the same waiver in June, said "the record is in" on that line of thinking. "After more than two decades of waivers, we are not closer to a lasting peace agreement between Israel and the Palestinians," Trump said. "It would be folly to assume that repeating the exact same formula would now produce a different or better result." 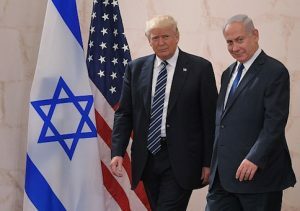 Trump said the announcement is not a departure from the U.S. goal of creating a "great deal" for both Israel and the Palestinians, saying it is not a stance on any final status negotiations over the city's boundaries. Trump also made a plea for "calm" in the wake of his announcement. Palestinian factions have called for "three days of rage" over the decision. "Today we call for calm, for moderation, and for the voices of tolerance to prevail over the purveyors of hate," he said.